Since July 9, gas stations selling 85-octane have been required to post a cautionary label. The label at Graffitti's Car Wash on West Main Street reads, "This octane level may not meet minimum manufacturer specifications. Consult your owners manual before fueling." Don Fleck fills up with 91-octane fuel at Graffitti's Car Wash on West Main Street on Monday afternoon. Fleck, who drives a 2010 Toyota Camry Hybrid, says he may not have noticed the 85-octane cautionary label if it wasn't pointed out to him because his car requires the 91-octane. Now a week into emergency rules making 85-octane gasoline legal to sell in South Dakota, many gas stations in Rapid City have not yet posted mandatory labels on pumps warning customers to check the owners manual before filling up. 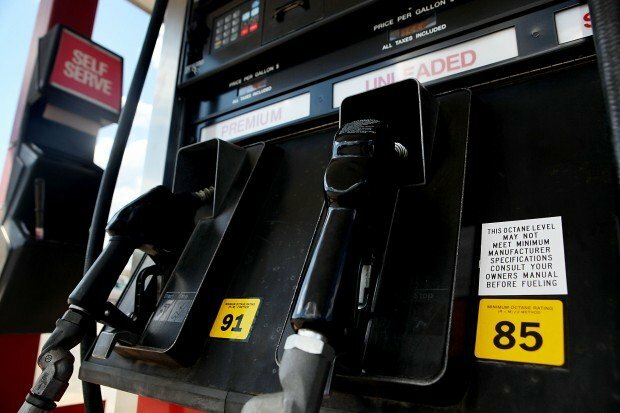 Since July 9, gas stations selling 85-octane have been required to post a cautionary label telling customers the sub-grade fuel could damage their engines. Each station was on its own to have the labels printed and displayed, though some around the city have not. Among the gas stations selling 85-octane gasoline without warning labels are a Phillips 66 on North Lacrosse Street, Conoco Phillips and Corner Pantry on East North Street, and the Safeway on Mountain View Road. "The Office of Weights and Measures is making it a priority for inspectors to check for proper labeling and paperwork for compliance with the emergency rules, although not to the extent that they are expected to drop all other inspection responsibilities," said Terry Woster, spokesman for the Department of Public Safety, which contains Weights and Measures. Woster did not specify whether there was a fine for not having the warning label, and the emergency rules do not spell out repercussions. "When our inspectors are at a station, they try to educate the retailer there about the requirements of the rules and what is expected of the retailer," he said. The emergency rules came after a review of state laws concluding the sale of 85-octane gasoline is illegal anywhere in South Dakota, which Attorney General Marty Jackley confirmed in a June 21 opinion. DPS wrote the emergency rules to allow sale of 85-octane while the public comments on proposed permanent rules. 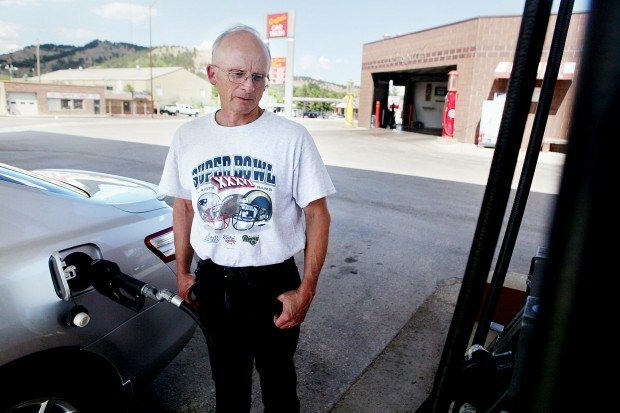 Several Rocky Mountain states allow the sale of 85-octane fuel at high elevations where it reacts differently in engines, and it has been a commonly sold product in western South Dakota for many years. Most engines are designed to run on a minimum of 87-octane gasoline and 85-octane could cause knocking in some vehicles. The 85-octane issue is unrelated to E-85, a reference to a motor fuel that contains a blend of gasoline and up to 85 percent ethanol. Ralph Rogers of Rapid City filled up his Ford F-150 truck tank with 85-octane fuel at Safeway on Monday. He said he has used it since 2004 without problems but has not seen any warning labels on pumps recently. "What good is a warning if they don't get out and enforce it?" he said. A spokesperson at Safeway's corporate offices was unavailable to make comments Monday. Tracy Mailloux of Rapid City said he generally will not put in less than 87-octane into his personal vehicle, but he filled the company car with 85-octane from Safeway on Monday. "I just got it because it was the cheapest thing," he said. In some places 85-octane is more expensive than higher-grade gasoline that has a low percentage of ethanol mixed into it. Some local gas stations heeded the call for warning labels, such as the BJ's gas station in Black Hawk. Kim Benne, owner at Graffitti's Car Wash on Main Street, which also has gas pumps, said he spent about $2 per label to have them printed at a local printing shop. They are clearly displayed and easily readable below the sign for 85-octane explaining that drivers should check their manuals before pumping. "The warning labels are fine," Benne said. "If that is what (the state) wants to do." Contact Ryan Lengerich at 394-8418 or ryan.lengerich@rapidcityjournal.com. A public hearing will be held Friday, July 20, at the Capitol Lake Visitors Center, 650 East Capitol Avenue, in Pierre starting at 10 am CDT. Any questions about the comment or hearing procedure should be directed to Jenna Howell, Director of Legal and Regulatory Services: jenna.howell@state.sd.us or 605-773-3178.